Review #3: Background Builder – Revive your User Interface! A few weeks ago, we introduced you to a company named Centigon Solutions, who is in the business of creating Xcelsius 2008 Flex custom components! As one of the pioneers in this very new segment, they’ve managed to create some very practical, but much needed and very exciting Xcelsius components. The ‘Background Builder’ is an awesome example. Not only is it God sent to the design challenged developer…but it allows any Xcelsius user to ‘Revive their dashboard User Interfaces’ with the click of a mouse! Be sure to read until the end…we have a special limited time offer only available through our blog for our readers..and no we don’t get a dime. It’s just a must have! So what is the ‘Background Builder’? It’s a simple Xcelsius Add On that takes 5 minutes to install, 30-45 minutes to create a new design and can literally save you hundreds, if not thousands in custom design work for your Xcelsius dashboards. Don’t believe us?! See our example below. 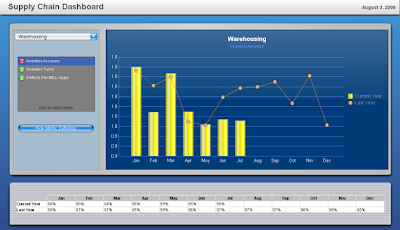 Here is the Supply Chain dashboard template that comes with Xcelsius 2008 SP1. It was designed by a professional designer and looks great. Below is the revision that we did. It took us about 30 mins. We started from scratch and we were quite surprised with the results! See for yourself…interact with the model below. Oh yeah….did we mention that Centigon’s support is awesome?! Note: Downloading the model will require you to download at minimum, a free trial of the background builder. The free trial will allow you to view this background, download other templates from Centigon to use in your models and create your own cool backgrounds…but until a license is bought the design will disappear in 7 days. Have no fear! We’ve arranged a special Centigon’s components bundle package through the month of Nov as an early Happy Holiday and thank you to all of our readers. You can save $15 off the Xcelsius plugins components bundle for Xcelsius 2008. The components that come packaged in this bundle include Background Builder, Dynamic Sort, and Reverse Selector. When combined, these components will streamline the Xcelsius dashboard development process and add functionality that will make your dashboards look and perform much better than ever before! Happy Holidays! Feel free to send us screenshots of what you did…we’d love to see..Thanks! So we finally came to a decision on what our first template would be and here it is! Keep in mind we hope to crank out more of these, depending on your feedback. Scenario Button allows the user to save, load and delete scenarios. Try it! Horizontal Line is strictly cosmetic on both tabs! At the bottom we included a URL button which links back to our blog. Just credit for our hard work. If you find this article useful please rate and/or share with others by clicking below. Guru Review #2: 10 Xcelsius Template Websites you can’t live without! Ever wonder where you can find some of the best Xcelsius templates on the web? Well look no further. Below we list and review the top 10 Xcelsius template websites we’ve seen online! While most of them do not contain downloadable source files, they are a great place to gain inspiration and ideas for dashboards in any industry! Note: While most are in 4.5, we gained word that some of the sites will soon post their Xcelsius 2008 versions. We’ll keep you posted! #1 Analysis Factory Templates – For the Xcelsius innovator and designer this gallery is certainly one of the finest on the web and guaranteed to spark a few design ideas! It’s our #1 pick for flawless dashboard design and rendering! Like you, we were wondering how they get those cool designs? Analysis Factory was nice enough to tell us that they have an in house designer who updates their original Xcelsius designs in Photoshop and then imports them into their models utilizing the image component, giving them that professional, polished look! #2 Inverra Dashboard Demos – Patrick Quirk is a great guy and is the owner of Inverra. We were pleasantly surprised at the amount of innovation in these dashboards! 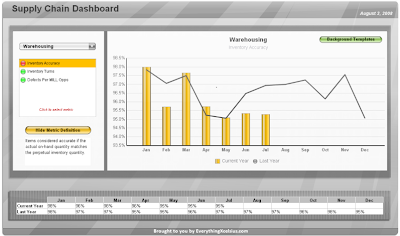 While they are NOT downloadable he has a variety of Xcelsius dashboards in different industries to look at! Great place to get a few ideas. #4 Ryan Goodman’s Downloadable Blog Templates – While not highly focused on the design, Ryan Goodman’s Xcelsius 4.5 & 2008 templates are nicely categorized. What’s nice if that most of them have an associated article explaining how he built them! OH, did we mention they are also DOWNLOADABLE? #5 Xcelsius WordPress Downloadable Templates – For those seeking to download a few of the original Xcelsius 4.5 template source files this is for you (click here for steps on how to import to Xcelsius 2008)! Be sure to also check out some of the author’s dashboard work here. #6 BOBJ Xcelsius Templates – While we are a bit disappointed that they removed most of the Xcelsius 4.5 templates, and made the source files for the new Xcelsius 2008 ones non-downloadable, the official Xcelsius 2008 template website is a great place to start. #7 Xcelsius for Dummies Gallery - Michael Alexander the author of ‘Xcelsius for Dummies’ did a great job here of providing videos with step by step instructions on how to build these Xcelsius 4.5 templates. Very easy to learn and understand. Great for beginners! #8 Xcelsius Journal 2008 Templates – Rated as #8 due to the number of templates available, this is one of the only places with Xcelsius 2008 templates on the web. Non-downloadable, Loren Alexander does a great job of displaying the capability of the software. #9 Xcelsius Best Practices Sample Xcelsius Templates – Rated as #9 due to their overall lack of design, Loren Alexander again presents some interesting ideas on how to build a dashboard in Xcelsius 4.5. #10 Dashboard Spy – This is an anonymous blog with sneak peeks of corporate dashboards that would otherwise be non-viewable to the public. Its great to see what other companies are doing. This is one you should definitely bookmark as it is updated daily with all kinds of Xcelsius and non-Xcelsius dashboards! Be sure to bookmark us to receive the latest templates right here at Everything Xcelsius. We’d love to hear from you. Please feel free to comment, bookmark, or share our articles using the buttons below!